The non-linear paths of the meteors are, as flying cloud said due to the fish eye lens. The coronae are also an optical effect, generally known as diffraction. The standard explanation for diffraction assumes light to be acting as a waveform, deflected by the media of the lenses used to focus the image, or possibly by particulates in the atmosphere, eg. from water droplets or ice crystals in clouds. My perspective on coronae, rainbows and other halos and spectral phenomena is that they have nothing to do with waves, rather manifest a pressure gradient, describable by vectors about the central line of sight. It should be understood, although for some this may be counterintuitive, that all such halos and rainbows exist [ie. are phenomenal] only "here" at the retina the eye or screen of a camera obscura... they do not exist "out there" in space, in the air or at an interface of raindrops. It is an optical effect, the endpoint [eg. the retina] of the light rays is where the action is happening, ie. the detection of the pressure field gradient we call the spectrum. In as much as light fields and electrical fields both manifest the universal/unified centropic pressure field in my view, the apparent glow about the burning heads of the meteors may be considered at least related to electrical phenomena. In as much as meteors also produce "occasionally audible" radio "rays", this is a further unification of the electric meteor framework. Finally found a confirmation, from Immanual Velikovsky, of all people . From his paper Cosmos Without Gravitation. 26. Ch. 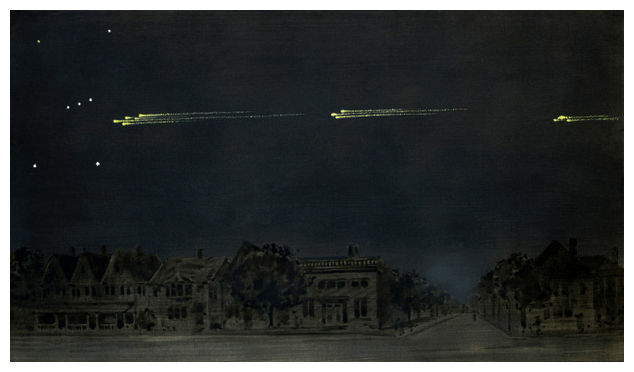 Olivier, Meteors, p.129. I’m not sure if I’m posting in the right section - feel free to let me know and I’ll move to a more appropriate space. What I wondered is if anyone had any EU perspective on a meteor even that happened in 1913. It was said to be a meteor procession though there were disagreements even at the time ranging from a decaying orbiting ‘moon’ ; multiple meteor events and even UFOs. I understand the EU has a different concept of what makes a meteor (not the iced dust ball) - so I wondered if there might be any different theories of the possibility of what this 1913 event was or wasn’t. ........................................"The meteors were particularly unusual in that there was no apparent radiant, that is to say, no point in the sky from which the meteors appeared to originate. The observations were analysed in detail, later the same year, by the astronomer Clarence Chant, leading him to conclude that as all accounts were positioned along a great circle arc, the source had been a small, short-lived natural satellite of the Earth.."
I doubt if the EU take on this event differs too much from the official one , NASA's view is " that a single large meteor once grazed the Earth's atmosphere and broke up. When the resulting pieces next encountered the Earth, they came in over south-central Canada, traveled thousands of kilometers as they crossed over the northeastern USA, and eventually fell into the central Atlantic ocean." Are you perhaps mixing up a meteor with a comet ? I've just been looking at what establishment sciences defines as these two...from what I can gather , reading between the the lines ,there is no real difference , no sharp dividing line. Exactly the same as planets , the further out the planets are the more liquids and gasses they have, if you brought jupiter close to the sun , all the volatiles would go, and something like mercury would be left. This UFO site is quite sensible ...http://cognizantnationhq.weebly.com/blo ... ase-proven ...and raises some good points.